Nakilat-Keppel Offshore and Marine (N-KOM), the joint-venture shipyard between Qatar’s Nakilat and Keppel Offshore and Marine, has signed an agreement with Greece’s Angelicoussis Group of Companies to continue with the latter’s ship repairs in the Middle East. The agreement applies to all vessels operating under the Greek group, which has more than 110 vessels and owns and operates the largest fleet of vessels in Greece. N-KOM is located at Erhama Bin Jaber Al Jalahma Shipyard, in Ras Laffan, Qatar. “The Angelicoussis Group has been an important partner in Nakilat’s expansion and growth over the years. We are delighted to see our long-standing partnership continue to grow with the signing of this fleet agreement and we are confident of providing Maran with quality ship repair services for their fleet of vessels,” Nakilat managing director Abdullah al-Sulaiti said. 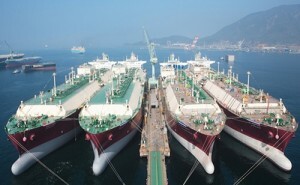 Maran Gas Maritime’s LNG (liquefied natural gas) carrier was the first vessel to be dry-docked at the shipyard when it commenced operations five years ago and since then, the shipyard has gone on to service 13 LNG carriers and tankers from Maran Gas and Maran Tankers. “We are very satisfied with the high quality of repairs executed by N-KOM for our vessels and are pleased to be extending our association with the Nakilat family through yet another strategic venture,” according to John Angelicoussis, chief executive of Angelicoussis Group of Companies.